SystemBoosterPro is the PUP that uses misleading techniques to prevent removal. Use Reimage to locate malicious components and get rid of them faster than with uninstall instructions. A full system scan blocks virus reappearance and prevents traffic to malicious domains. Can the app be installed without my notice? SystemBoosterPro serves as a PC optimizing tool. Netizens who are annoyed by extremely slow computers look for various ways to boost up the efficiency of their devices. Such offers happen to be a perfect target for various PC improvement tools‘ manufacturers. Naturally, there are many programs which hardly meet the security requirements, and instead, users scare with non-existent viruses to persuade them into purchasing the full-version. Likewise, this program also sparks such suspicions since it provides quite a big number of system issues and other alerts to alerts users. Likewise, you may mistake this program for SystemBoosterPro virus. Let us assure that it this utility is not malicious. Nonetheless, due to its questionable efficiency, it is regarded as a potentially unwanted program. Let us briefly present the key arguments it would be better to remove SystemBoosterPro. If you are thinking about improving the general efficiency of your system, you might easily get lost in the myriad of applications. Despite almost identical titles, their offered services do not differ either as well. However, other software manufacturers try to appeal to users with a universal and wide number of features. Nonetheless, keeping such tool on the system may have negative effects on the computer. First of all, the initial intention is to attract as many new customers as possible. The developers of questionable applications may employ various techniques to achieve this aspiration. They may either fake hundreds of positive ratings or use more elaborate techniques, such as retargeting, to follow you with its ads. 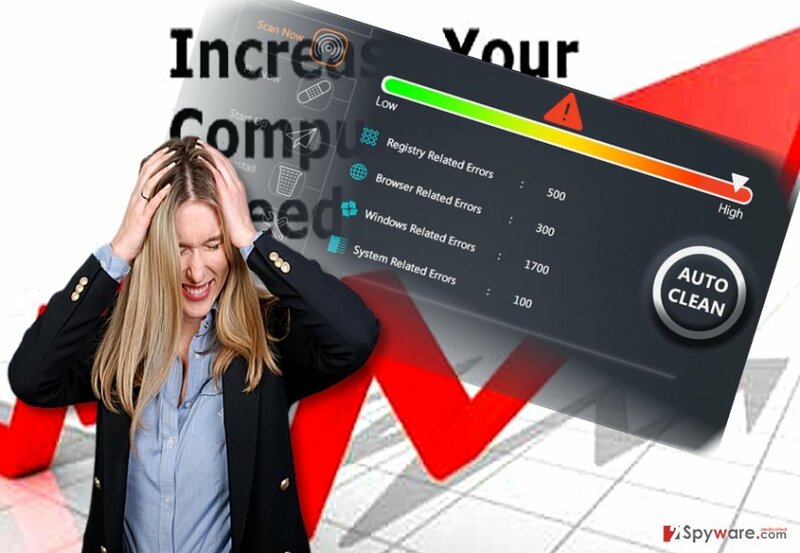 System Booster Pro hardly boosts up your PC's performance but rather loads you with misleading system alerts. Persistent ads may eventually convince you into visiting their web page and perhaps make a purchase. Alternatively, if you were looking for a security app to clean your device, you might have come across System Booster Pro as well. After performing a quick scan, it will inform you about dozens of system issues and potential threats. Less experienced users might fall for such bait thinking that their devices are heavily infected. However, it is just another marketing trick. Nonetheless, some might even rush to purchase the full version in the pursuit of deleting the possible infections. After installing it, the program seemingly deletes the viruses and solves the problems. What it does is simply the elimination of its own fake alerts. Keeping SystemBoosterPro on the system for a while may, in fact, increase the general vulnerability to outside threats. Specifically, such app may overlook real and highly destructive malware present on the system and likewise only increase the scale of possible damage. To sum up, there is a significantly small number of tools which increase the technical capabilities of your system, and the majority of them are just fake rogue applications which might cause more trouble rather than bring benefit. Users install such tools are usually deliberately. They may spot their ads online or in the websites promoting computer security tools. In fewer cases, you might accidentally install SystemBoosterPro bundled along with another free program. Usually, such programs are attached under the “Recommended” settings. After that, you click the “Install” button you accidentally enable the installation of add-ons as well. If you would like to prevent such tools from entering your system without your notice, make sure you choose “Custom” settings. Later on, unmark all unwanted optional programs and proceed with the installation. 3. Find “System Booster Pro” and select “Uninstall” function. 2. Find the “System Booster Pro” in the list. ^ Stephen Lawton. Rogue apps plague IT teams, survey finds. SC Media. The cybersecurity source. ^ PUPs Explained: What is a “Potentially Unwanted Program”?. How-to_geek. By Geeks, For Geeks. ^ Amanda DiSilvestro. What’s the Difference Between Remarketing and Retargeting?. SEJ Journal. SEO, Search Marketing News and Tutorials. ^ Swapnil Bhagwat. Digital marketing trends that can make a difference in 2017. Customer Think. News and opinions. ^ Juha Saarinen . Testing reveals sad state of Android anti-malware apps. ITNews. For Australian Business. This entry was posted on 2017-02-28 at 01:07 and is filed under System tools, Viruses. You can quickly scan the QR code with your mobile device and have SystemBoosterPro virus manual removal instructions right in your pocket. How did you remove SystemBoosterPro virus?